Today the Committee on Bible Translation, which is responsible for the NIV translation, has released an “update” of the NIV. This was, in days gone by, the de facto standard translation in the LCMS, though in recent years the ESV has become more common via, initially, the Psalter text of the Lutheran Service Book, and from there it seems that Concordia Publishing House has adopted the ESV as the “house” translation. But, many still use the NIV. There are some rather substantive changes in the text (apparently it will just be called “NIV” — you’re sort of stuck after you call something “New” and then update it several times over the years — “Newer”? “Newest”?). I won’t go into the details of most of these; the principles of editing and some examples are helpfully provided by the editors. I strongly encourage you to take a look at these. A few of the key principles are that 1) language changes — “alien” to most people means E.T. or creatures that burst out of bellies, it doesn’t most often mean “foreigner.” This seems to be the most common reason for a change. 2) Historical study and scholarship allows us to be more certain about the meanings of Greek and Hebrew words. One that will set people off, no doubt, is to hear on Christmas Eve: “She wrapped him in cloths and placed him in a manger, because there was no guest room available for them.” “Guest room” more accurately translates κατάλυμα, but most churches will have to get rid of the innkeeper costume from the Christmas Pageant. There were no Motel 6s in the first century, and Joseph’s problem was not failing to provide a credit card to hold his reservation but finding no room in someone’s house. 3) This is not identified in the provided document, but there are also some changes made as the result of reaching a different decision about textual variants. So in Mark 1:41 Jesus is “indignant” at the question of the leper, not “moved by compassion.” I happen to agree with this choice, but get ready to explain an angry Jesus to your Bible study class. 4) General accuracy. Ambiguity often leads to inaccuracy. My favorite fix is Philippians 4:13, which now reads “I can do all this through him who gives me strength” rather than “I can do all things . . .” There goes one of your best “name it and claim it” verses. So many Inspirational posters will have be torn down and bookmarks and coffee mugs tossed out that there may be a landfill crisis on the way. The entire Christian trinket industry may fold as a result. It is not necessary to comment on every change; some you will like, and some you will not (although perhaps the choice should not come down to “what you like”?). For those whose orthodoxy meter is set to look for only one passage, it is still a “virgin” that will conceive and give birth. What is more interesting (and important) is whether or not this is all a good idea. Language changes, culture changes. But do we need a new, updated translation every 15 years or so? What about memorizing Bible passages? And what does this do to the authority of what we are reading, and upon which we base out teaching and preaching? For those whose Greek and Hebrew is up to snuff (and up to date) this isn’t that big a deal. But I can imagine some very disconcerted faithful Christians asking “what does this mean?” Any answer? I saw this yesterday. It looks like we might finally be able to start correcting our Christmas programs, as they switched “Wise Men” to Magi in Matthew too. As far as the implication for the “common man”, I think we need to teach them that the bible (read formal translations which have been composed by researching older texts) is messy. This has been a topic which I have tried to engage my people with on vicarage. Its my opinion that if we, the clergy (or those in training) understand this fact of the dirty, human-covered process which lead us to the utilization of the texts we use in church, then we can teach our people, not giving them spiritual milk, but solid food. I think the answer for the faithful is two-fold: first, the edification of their faith by the affirmation of the truth of Scripture, as it bears witness to Christ, the truth of God. The second is to highlight for them the reality of the presence of God’s Word in that the bible we have works, that is the Spirit still works faith in human hearts from the hearing of its words. How does it come that you and numerous other writers have stopped spelling the name of the book Bible ? Is this some kind of politically correct writing style? Somewhat cynically perhaps, I wonder how many people will notice. It has long befuddled me that in a church with a high view of Scripture, one scarcely sees a copy in the hands of Sunday morning worshippers. It’s the pastor’s fault, Damian. It always is. I suspect one issue is that we talk about the Bible, and tell people to read the Bible, but a lot of what we preach about is often only tangentially related to the biblical text. So someone trying to follow the text and listen to the sermon will have no idea how the preacher got that out of the Bible. If they can’t figure out how the pastor is interpreting the text, how will they learn how to read properly? This would ideally take place in Bible studies, where pastors could walk people through the texts so that they learn how to read for themselves. But perhaps our sermons could be more explicitly connected to and derived from the text? one question i have had of late concerns the wording of the creed…. on the third day he rose…..why no distinction of the time in which Christ was present on earth for 40 days and, then, ascended into heaventomake clear He remained bodily on earth appearing to men??? some who read and memorize the creed the way it is now worded can assume after 3 days He ascended into heaven and we know this can’t be true? why did those composing the wording of the creed not make it clearer that fter 40 days He ascending. he sat at the right hand of God, the Father Almighty . . . In English we smooth things out a bit (such as not repeating the subject “he” expressed in the verb in each clause). Perhaps this, and running things together rather quickly when we say it, leads to confusion. And he will come again with glory to judge living and dead, whose kingdom will not end. Greek doesn’t use punctuation during the time when the creeds were written, so the “and” marks a new unit of thought. In English, again, I suppose for the sake of smoothness, we don’t use the “and” every time, and this may lead to confusion. I suspect that the creed uses “on the third day” because it adopted the wording from 1 Cor 15:3-4; the ascension is not mentioned in 1 Cor 15, and in Acts, where it is mentioned, there is no real OT significance attached to it. So the 40 days was not emphasized in the creeds the way that “on the third day” was. So, you can blame our English translators of the creed, but things are clear enough in the original Latin and Greek. I would speculate that in this instance, more problematic than preaching that is not textual(which is certainly a problem in and of itself, is the lack of participation in “Bible Studies”. What is the cause? I don’t know (although I have some ideas). However, I imagine that it is probably the pastor’s fault as well! Interestingly, I was once blamed by a former parishioner for the fact that he had left the church and I did not search him out. That may sound like a reasonable complaint and that I was negligent in my duty until you also know that his “falling away” occurred when I was but 8 years old or so. Interesting article, but let me offer a significant correction. The author states: “in recent years the ESV has become more common via, initially, the Psalter text of the Lutheran Service Book.” This is not correct. The English Standard Version was adopted as the translation of choice by The LCMS Commission on Worship to be used in all Lutheran Service Book materials, including most significantly, the lectionary, both one and three year series. Bible quotes throughout the LSB project are in ESV, and the ESV was specifically referenced and adopted by the convention that adopted the LSB. 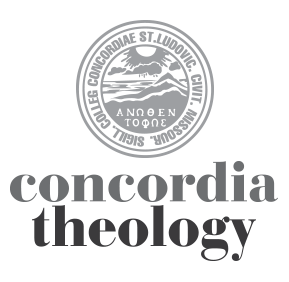 The decision to use the ESV was one made after careful consultation with both seminary faculties and with the Synod’s CTCR, which advised The LCMS Commission on Worship that the ESV would be a good choice, to be preferred over the NIV. I was discomforted by the author’s remark that the translation of “almah” in Is. 7:14 is an “orthodoxy meter.” To which I would say, of course it is. The holy Christian Church, both in the Sacred Scriptures themselves, and throughout its long history, up to and including all orthodox Lutheran theologians, understood and translated “almah” as virgin. So, if this is what the author intended to communicate with his use of the flippant comment “orthodoxy meter” then I would agree. If that is not what he meant, the comment is troubling. Since you bring it up, Rev. McCain, I was responsible for the NT portions of the 2001 Commission on Worship document titled “Comparative Study on Bible Translations” (link here: http://www.lcms.org/graphics/assets/media/Worship/BibleComp.pdf), and my comments reflect my involvement in that document. It was made clear to me that the main concern for that study was in fact the Psalter text (a detailed analysis of the Psalter was printed under its own title, I’m unable to locate that document now), as is stated in the introduction, especially the last three paragraphs. For example, “Not only must a translation of the Psalter be chosen for inclusion in the new hymnal itself, but also a suitable translation must be provided for the many other Scripture passages that appear in the orders of service and in the rites in the Agenda.” No mention is made anywhere in that document of using the text recommended there for the lectionary volumes (or other resources, such as catechisms). Now, I think the assumption was that the translation adopted for the hymnal would also be used for the lectionary volumes (and ultimately this was the decision of the Commission on Worship), but I stand by my statement that the initial and primary concern was the psalter text at that early stage. For what it is worth, for the NT I did recommend the use of the ESV. The most objectionable feature of the RSV is that it inaccurately renders many passages that refer to the divinity of Christ (examples 22, 29). Furthermore, its rendering of Old Testament prophecies often conflicts with the New Testament fulfillment, e.g., using “created” instead of “begotten” in Prov. 8:22 (see also examples 23, 24, 25, 26, 27). In places, other serious theological problems can be found (examples 18, 30, 32, 35). Even had they rendered Isaiah 7:14 faithfully, there would have been much more of concern. As someone who is engaged in Bible Translation for a minority language in Ghana (less than 500,000 speakers) I welcome the discussion. For our purposes here in Ghana the NIV has had a strong impact as a form – equivalent translation, the translators I work with use the NIV as their base text supplemented by my own Greek study and helps I can provide them from commentaries etc. The common pastor in our area will look to the NIV to gauge the reliability of our work. Professionally I am happy that they are coming out with a newer NIV translation in hopes that the newer translation is more often in agreement with exegetical decisions that we have made so as to ease the criticism we might receive for going against the now ‘old’ NIV. (Maybe even Matthew 11:12 – this coming Sunday’s gospel). At the same time, from the perspective of church goers and pastors at home, I worry that the myriad of translations discourage memorization, discourage repetition so that the words no longer ring in our ears with traditional referentiality recalling instances when we have heard those very same words before. Since in Ghana we are also surrounded by Islam and their view of their sacred text there is a high desire on the part of many church leaders to be very careful with the text so that we might not appear to have multiple versions of the Bible. Of course no one wants an unreliable Bible, but at times the leaders in my view are willing to sacrifice the communication of the gospel for the hearers to preserve a high view of the original (English?) text. There is a danger here in that the living voice of the Gospel is silenced to preserve a mechanistic view of the text. The opposite danger of course is playing fast and loose in such a way that we don’t respect the Bible as actually a foreign document that comes to us as a stranger of sorts so we attend to it. Or that we make the Bible preach rather than the preacher. Thank you for the perspective, Nathan. The issue of consistency for the sake of memorization is critical, though I have to admit that what I have “memorized” now depends on when I learned it and whether I teach it in class — sometimes I have my own translation memorized, rather than any printed version. I’d be interested in hearing more about views of the Bible in an Islamic context. It sounds like one strategy is to make people think the Bible is “reliable” in the same way that the Koran is “reliable.” But doesn’t that diminish the uniqueness of the Bible? Yes. I think we need to do more to show the uniqueness of the Bible in its own right. Its unique history of transmission is part of that and I think important to bring out because our hidden assumptions about the Scripture text may not be in line with either historical inquiry or Christian theology. In our context, the views of Islam have influenced Christian assumptions about the sacred Biblical text. Theologically I have often referred to the Pentecost translation event from Acts 2 as a starting place to discuss translation and the Bible itself. There is an example of the Spirit translating the preached word, but it is also written down for us right there in Acts. Is hard then for us not to follow that trajectory. That kind of skips over the history of transmission issue, but when you get back to that it reframes the discussion from a starting point that is more helpful.